Class of the Pasted Canvas layer. References synfig::Time::begin(), SET_INTERPOLATION_DEFAULTS, and SET_STATIC_DEFAULTS. Recursively update the Render Description for the inner inline only pasted canvases. Used for copy and paste Paste Canvas Layers between compositions. Gets the canvas parameter. It is called sub_canvas to avoid confusion with the get_canvas from the Layer class. Referenced by synfig::Layer::get_parent_paste_canvas_layer(), and synfig::optimize_layers(). References synfig::Node::add_child(), synfig::Layer::get_canvas(), on_canvas_set(), synfig::Node::remove_child(), and signal_subcanvas_changed(). Referenced by svg_layer::set_param(), set_param(), synfig::Canvas::~Canvas(), and ~Layer_PasteCanvas(). Referenced by get_summary_transformation(), and synfig::optimize_layers(). References get_origin(), get_transformation(), and synfig::Transformation::transform(). Referenced by accelerated_cairorender(), accelerated_render(), get_bounding_rect_context_dependent(), get_color(), and hit_check(). Reimplemented in synfig::Layer_Group, and synfig::Layer_Switch. this introduces bug 1844764 if enabled; it was introduced in r954. 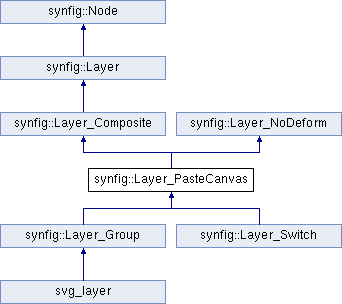 Reimplemented in synfig::Layer_Group, synfig::Layer_Switch, and svg_layer. References synfig::ValueBase::can_get(), synfig::Node::changed(), synfig::ValueBase::get(), IMPORT_VALUE, synfig::ValueBase::put(), synfig::ValueBase::same_type_as(), and set_sub_canvas(). Referenced by get_bounding_rect_context_dependent(), get_color(), hit_check(), and synfig::optimize_layers(). References synfig::Color::alpha(), apply_z_range_to_params(), synfig::Transformation::back_transform(), synfig::Color::blend(), synfig::Layer_Composite::get_amount(), synfig::Layer_Composite::get_blend_method(), synfig::Context::get_color(), synfig::Context::get_params(), get_summary_transformation(), and MAX_DEPTH. References synfig::ValueBase::get(), MAX_DEPTH, synfig::ValueBase::set(), and synfig::IndependentContext::set_time(). shouldn't a mutex ensure this isn't needed? References synfig::Context::accelerated_render(), synfig::ProgressCallback::amount_complete(), synfig::Time::begin(), synfig::Color::BLEND_COMPOSITE, synfig::Color::BLEND_STRAIGHT, synfig::Surface::blit_to(), synfig::RendDesc::clear_flags(), synfig::ValueBase::get(), synfig::Layer_Composite::get_amount(), synfig::Layer_Composite::get_blend_method(), synfig::RendDesc::get_br(), synfig::Context::get_full_bounding_rect(), synfig::RendDesc::get_h(), synfig::Layer::get_parent_canvas_grow_value(), synfig::RendDesc::get_rect(), get_summary_transformation(), synfig::RendDesc::get_tl(), synfig::RendDesc::get_transformation_matrix(), synfig::RendDesc::get_w(), intersect(), synfig::Color::is_onto(), synfig::Layer_Composite::is_solid_color(), synfig::Color::is_straight(), MAX_DEPTH, synfig::Surface::alpha_pen::set_blend_method(), synfig::RendDesc::set_br(), synfig::RendDesc::set_tl(), synfig::RendDesc::set_transformation_matrix(), synfig::RendDesc::set_wh(), synfig::Transformation::transform_bounds(), and synfig::warning(). References synfig::Context::accelerated_cairorender(), synfig::ProgressCallback::amount_complete(), synfig::Time::begin(), cairo_paint_with_alpha_operator(), synfig::error(), synfig::ValueBase::get(), synfig::Layer_Composite::get_amount(), synfig::Layer_Composite::get_blend_method(), synfig::RendDesc::get_h(), synfig::Transformation::get_matrix(), synfig::Layer::get_parent_canvas_grow_value(), get_summary_transformation(), synfig::RendDesc::get_w(), matrix, and MAX_DEPTH. References apply_z_range_to_params(), get_summary_transformation(), synfig::Transformation::transform_bounds(), and zero(). References synfig::Layer_Composite::get_blend_method(), get_bounding_rect_context_dependent(), synfig::Context::get_full_bounding_rect(), synfig::Context::get_params(), synfig::Layer_Composite::is_disabled(), and synfig::Color::is_onto(). References apply_z_range_to_params(), synfig::Transformation::back_transform(), synfig::ValueBase::get(), synfig::Layer_Composite::get_amount(), synfig::Context::get_params(), get_summary_transformation(), synfig::Context::hit_check(), and MAX_DEPTH. Function to be overloaded that fills the Time Point Set with all the children Time Points. In this case the children Time Points are the canvas parameter children layers Time points and the Paste Canvas Layer time points. References synfig::ValueBase::get(), synfig::TimePoint::get_time(), and synfig::TimePoint::set_time().